I booted up my Xbox 360 to snag some DLC and make sure Django Unchained was indeed available for rent, and then I sort of just left the dashboard sitting there. This ad has now been looping into my apartment for the past 30 minutes. It's more or less the same ad I regularly saw on TV last weekend, when I was staying at a hotel for a wedding and had access to normal TV. Even at the time, I thought that the camera lingered a little too long on the one lady as she pulled back from her bite, her mouth half-open and full of McDonald's. Advertisements like to show us the promise and excitement of the lean in, of the chomp; they're usually less interested in the grisly aftermath. In the interest of accurately sharing the entire ad and not just my Vine-edited loop, I shot a quick video, in which you can see the whole weird milieu. 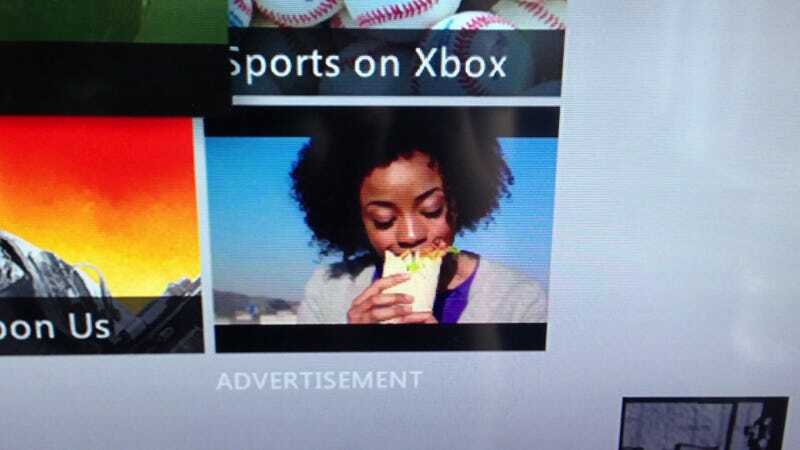 It combines people eating wraps with some confusing quick-cut imagery of like, golf balls and drumlines and stuff. America! Wraps! McDonald's! Marching bands! Video games!